Riding the Rail to London? Long time readers know by now that I advocate high-speed rail and similar transport infrastructure investment. 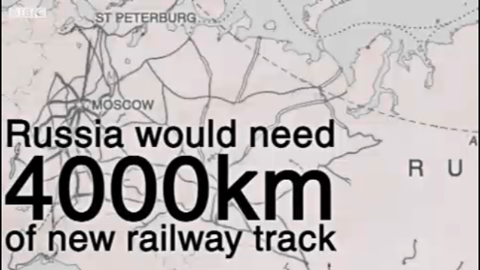 The following screenshot was taken from a BBC News video about the Russian proposal to build an underground passenger/freight tunnel beneath the Bering Strait to connect eastern Siberia to Alaska. The video is not an infographic, strictly speaking, but as a motion graphic it depicts the routes needed and compares the length of the proposed tunnel to that of the Chunnel, the tunnel beneath the English Channel. Back in August the Daily Mail also reported on the story and provided the following map showing how exactly the system would then link the Eastern Hemisphere to the Western Hemisphere. 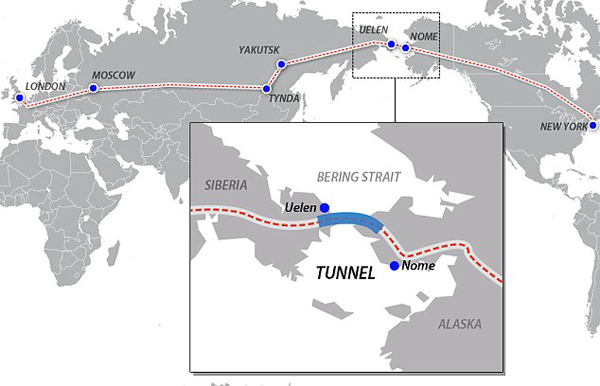 Of course the big questions that remain are can Russia afford to build the tunnel, will the United States build the rails necessary to link it to the main US–Canadian rail network, and would anyone really use it? Author Brendan BarryPosted on 25 October 11 11 November 16 Categories UncategorizedTags BBC, Daily Mail, economics, information design, maps, motion graphics, transportationLeave a comment on Riding the Rail to London? The European debt crisis affects all of us. Shares fall on the exchanges in Frankfurt, Paris and London and then ripple westward to New York before finally reaching Hong Kong and Tokyo. But does anyone understand actually understand who owes whom what? This interactive piece is yet another from the New York Times and is an online version of a print graphic that appeared in Sunday’s paper. 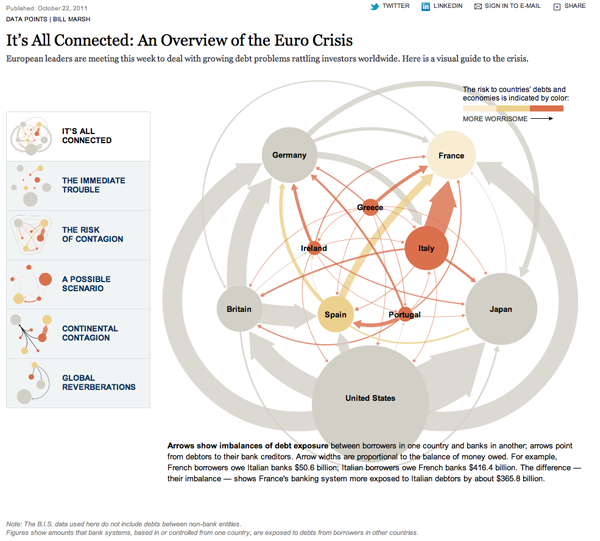 Online, interactivity is used to focus attention on particular elements of the story, highlighting key components of the tangled debt web that anchors the whole piece. The width of the lines relate the difference between borrowers and lenders. Hidden in the width of the arrows, however, is the gross lending. The lending may appear to cancel itself out, but the banks and other sources of the loans may not all be lending to each other, i.e., some big players could still take a hit if the crisis worsens. The colours reflect the level of ‘worry’ in the country—though how worry is defined is left unstated. Different parts of the story and potential scenarios are revealed by clicking buttons on the left-hand side of the piece. Elements of the large graphic that are not needed to tell that part of the story, though remaining pieces remain in place. This is an effective means of reminding the audience where they are situated in the overall web, but I wonder if not a slight shadow or faint trace of the web in the background could have been used instead of losing all the information entirely. Overall, the interactive piece is quite effective in telling the story. 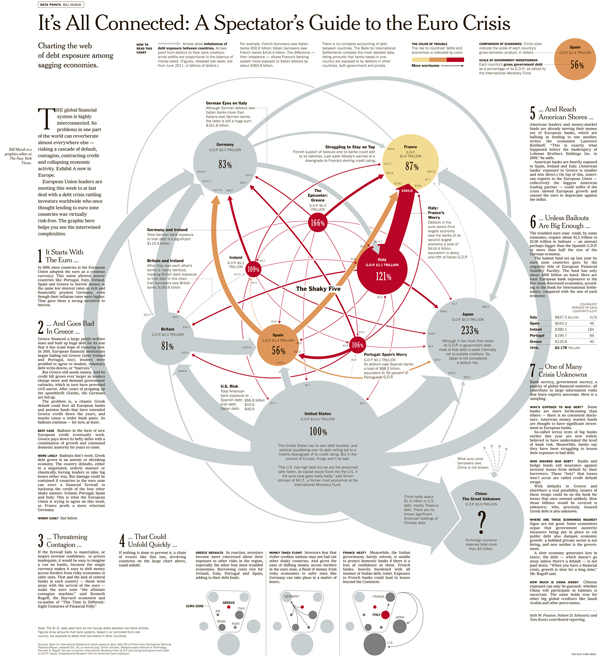 But, because this was in the Sunday paper, the lazy afternoon paper, we also have a large-scale printed infographic that the interactive piece accompanied. This has a lot more text—dreaded words—to further explain just what is happening. In my mind this adds to the story. For example, what I noted above about the net loans between two parties obscures the gross loans of both sides. This point is explicitly made about Britain and Ireland, which have enjoyed a very strong bilateral trade arrangement for a number of years. This context is added by a little text blurb crafted into the overall design of the piece. Different scenarios are highlighted at the bottom with a reduction of the main piece creating small multiples of the diagram instead of how the interactive piece removed unnecessary elements. I think this is an equally effective means of solving that problem. The New York Times created two separate but very much related pieces to explain a story that affects us all. The first media, the interactive piece, takes advantage of the ability to replace on the screen what is not necessary with what is necessary. Further, it allows some data that is not so relevant at first glance to be hidden. Mouse over the various lines and countries to reveal the data behind the problem for each. Do we need this information at first? No. Our first order is to try and work out the web we weaved. Well, that the bankers weaved. That is very different than the print edition, which cannot be changed. All the content must be available at once. But, the data is made smaller because the print resolution is finer than that of a screen. Small text that might not be legible on a screen can be printed and read just fine. The printed edition also allows more space and thus more text for context. And this is okay knowing that the Sunday paper is likely to be read while relaxing with a fine cup of tea or coffee. Credit for the piece goes to Bill Marsh. Gadhafi is dead. Sorry, I meant Kadhafi. Again, apologies, Qadaffy. For so many years we have tried to spell the now deceased dictators name. It’s been in Saturday Night Live (sadly I cannot find a clip online). It’s been in the West Wing. So how can it be done? The problem is that his name is in Arabic, which uses a different alphabet and so for the English-speaking world, transliterators must assign Latin alphabet characters to try and replicate the sounds in his name, some of which are unique to Arabic. Ever notice how the holy text of Islam is spelled often Koran or Quran? Just take that same problem and extend it further into a guy’s name. This graphic, from Wikipedia, shows how the different parts of his name can be transliterated. And very quickly one can see why nobody really knows how to spell the name. How to spell "the guy's" name. 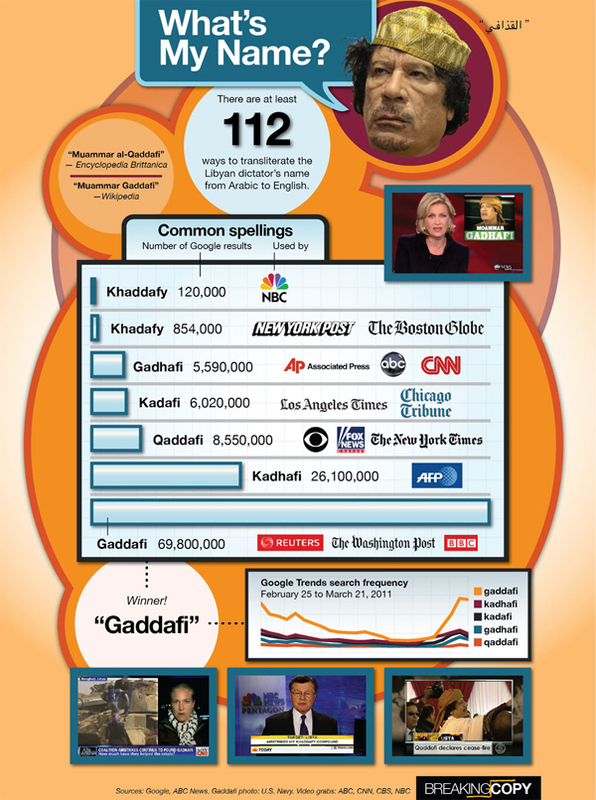 The next graphic is from Breaking Copy and depicts the most common ways of spelling the man’s name. The design of the piece is certainly more about entertainment than conveying a learning. But, it goes to illustrate the variance by major respected news organisations, all of whom are reporting on the man’s death. Credit for the piece goes to Daryl Lang. 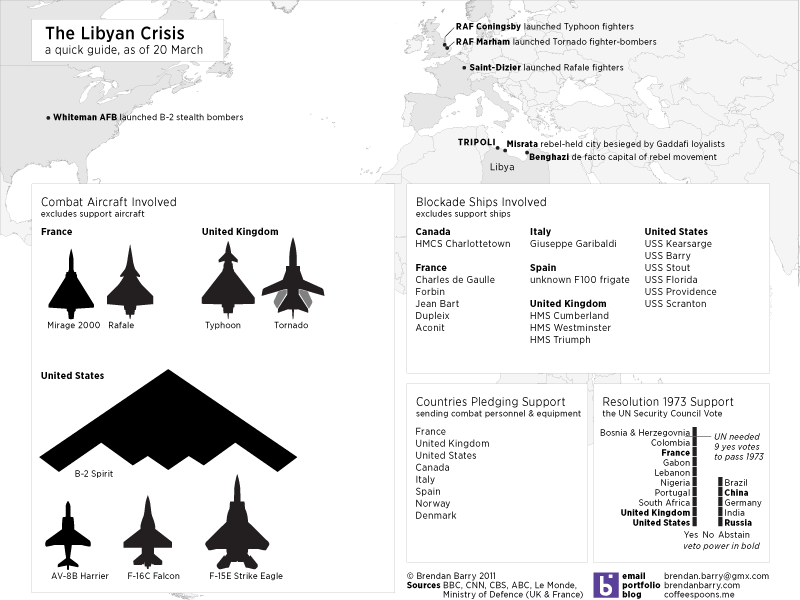 And as a retrospective, news of his death and the liberation of Libya made me think back to my own graphic about some of the very first airstrikes in post from back in March. Author Brendan BarryPosted on 21 October 11 11 November 16 Categories UncategorizedTags information design, just for fun, politicsLeave a comment on What’s In a Name? Campaign finance is always an interesting subject during election cycles. I believe I have heard that once a congressman wins election he needs to raise $1000 per week to stand a chance of re-election in two years’ time. One need only imagine the difference in scale for presidential contests. 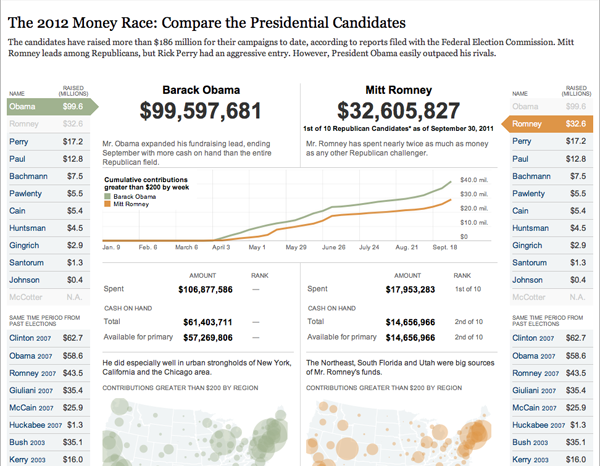 The New York Times created an interactive piece that details the financing, principally of this year’s primary campaigns, but alongside data from four years ago. Inflation hasn’t been too terrible, so the numbers are relatively comparable. Of some note, however, is that this time around this is not an ‘open’ election. In 2008 the sitting president was term-limited and his vice president was not running so both the Republicans and Democrats were open contests for any challenger to win. In 2012, President Obama will not (likely) have to fight other Democrats for the nomination of his party and his funding can be marshalled solely against his Republican challengers. Whereas the Republican challengers need to spend considerable amounts of their funding simply to get through the primaries. How do you feel about the economy? 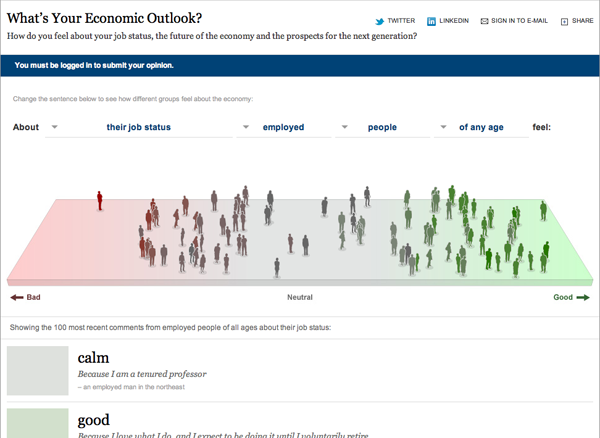 The New York Times has posted an interesting interactive visualisation detailing the sentiment expressed by participants—defaulting to the most recent 100—answering several questions on the state of the economy. As a survey, this is—and it is framed as such—an unscientific sampling of trending opinions of only those who feel inclined to comment and are registered members of the New York Times. What makes this more interesting is the ability to demographically filter the responses to find, for example, that the unemployed feel worse about their job status than the employed…perhaps that is not the best of examples, but, hey, it works. One can also find the specific response tied to a marker on the field/band/spectrum of responses by mousing over and then clicking on the symbol. A little and unfortunate quirk here is that clicking on the person forces one down the page to the specific comment, but then leaves one with no easy way of returning to the broader picture short of scrolling all the way back to the top. Foreign aid is the ‘soft’ power of a country vis-a-vis the ‘hard’ power of military force. Think blankets with ‘from the USA’ during earthquake relief in Kashmir instead of Abrams tanks in Kandahar. Some also goes to building infrastructure and increasing the standard of living for those in emerging countries. If you boost the income, you boost the buying power and thus boost the total possible market size. 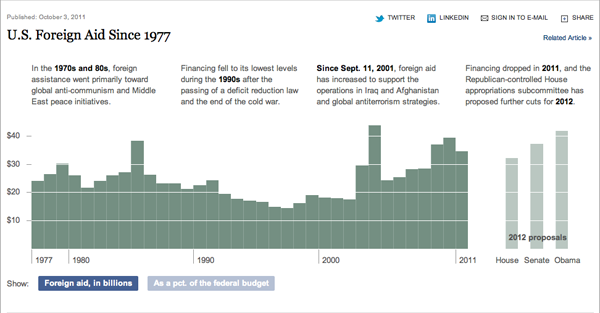 This chart, which supports this article, from the New York Times is simple but effective. Not only does it show the decreasing amount spent in terms of absolute dollars, but also as part of the overall budget. After all, one can, in theory receive a smaller (by angle) slice of pie, but if the size of the pie increases, you net more pie. And who doesn’t want more pie? Antarctica is a continent way down at the southern end of the world. It is covered almost entirely by glaciers. But glaciers move, and NASA and the University of California unveiled a map looking at the speed of the glaciers’ movements. Along with it, an interesting little video showing the tributaries to the glacial flow. So, those of you a little bit older than me—not to date myself—probably remember the evil Reds of Soviet Russia. Some my age do as well. Younger than me, it’s probably all ancient history. And so for those of you who forget, the Union of Soviet Socialist Republics was, if I am to simplify, a Russian empire that featured a centralised, command and control economy and a dictatorial government. In 1991, the empire fell apart for a number of reasons and became 15 independent countries, Russia still being the largest. And a lot has happened in the twenty years between 1991 and 2011. Twenty years being a long time, the BBC has remembered the event by creating a relatively simple piece that compares the fates of the various countries in the aftermath of the Soviet Union’s breakup. One takes one drop-down list and selects a country and then another country from the other list. And in the centre one can control whether the comparison is of wealth (GDP), health (life expectancy), or leadership (no. of times the presidency has changed hands). 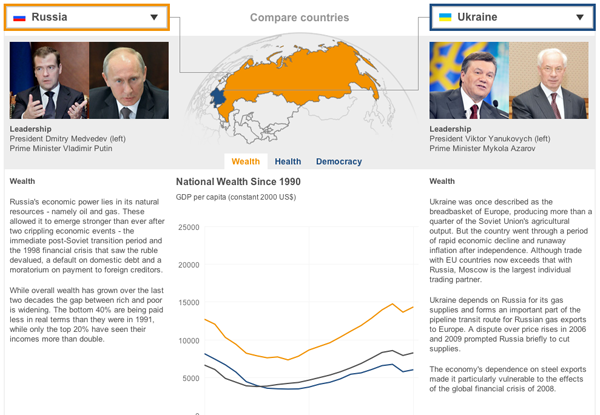 I have an issue with some of the metrics and whether they are the best suited to describe the wealth, health, and democracy of the former Soviet republics. But, I think the strength really is not so much the charts but the brief summaries for each country that try to capture the story of the past two decades. Living in Chicago, hurricane season means rather little. Perhaps at worst the city would see a major rain system moving up from Texas or the Gulf Coast. But, from all my time living on the East Coast makes hurricane season a bit more meaningful if now just as an outside observer. 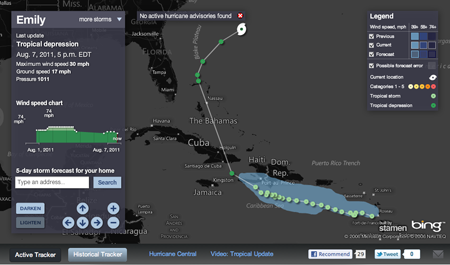 The Weather Channel has launched a site called the Hurricane Tracker that allows you to follow the current season’s storms. While there has yet to be any major activity, there have been a few named tropical systems that are present in what is called the Active Tracker. The storms are tracked geographically, showing you the precise locations where the storm was recorded and then filling out the path between points. The data includes information on strength—hurricanes are classed on a 1–5 scale with 5 being really most unpleasant—such as windspeed and pressure—hurricanes are enormous low pressure systems. The panel on the left of the screen provides a detailed history of the storm and links the recorded data points to the corresponding geographic points on the map. Currently, the storms have all been relatively minor and short-lived; watching a major storm of some duration through the charts and the map progression could be quite fascinating. 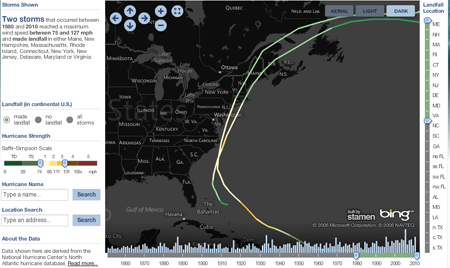 But there is also the Historical Tracker that catalogues an impressive number of previous storms. The view first loads with an overwhelming number of storm tracks, but filters for controlling the years—which includes a interactive mini-graphic of the total number of storms for each year that when clicked filters for only that year—and for location of landfall begin to significantly bring your search or exploration into focus. I have yet to find any detailed information about specific storms, the one in this screenshot being those that made landfall in the Northeast roughly during my lifespan. (I have memories of being at the shore during Hurricane Bob with the winds and rain and warning sirens making an impression.) You cannot click to focus on a particular storm, instead, a mouseover is the only way of discovering the name of a particular track. But, that may simply be an unavailable level of data, especially with the storms from the 19th and early 20th centuries. Now I just hope we can use this sort of information to help develop better forecasting and modelling to help save lives and property. Credit for the design goes to Stamen Design. As most of us know, the final space shuttle mission lifted off on Friday. 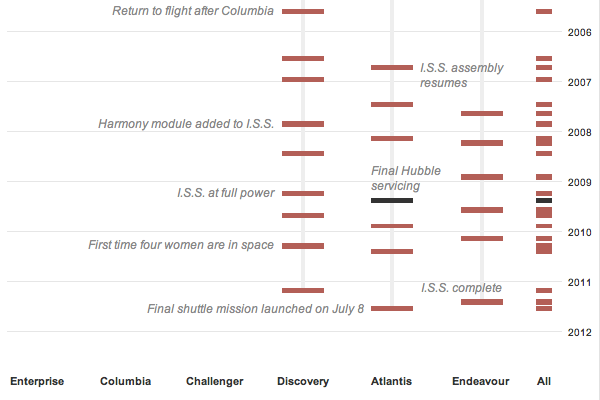 Appropriately, the New York Times created an infographic for the news stories accompanying the mission that details the history of the entire shuttle program’s flights. If you are a space-y kind of guy like me, it’s worth a look.